A man will appear in court charged with the murder of a French film producer, who was found buried in a shallow grave in her garden in west London. Laureline Garcia-Bertaux, 34, was reported missing on 5 March. 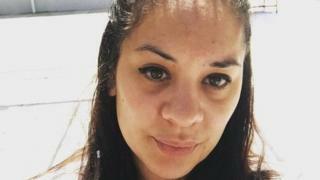 Her body was found the following day in the back garden of her home in Kew. Kirill Belorusov, 32, was detained in Tallinn, the capital of his home country Estonia, last week. He was taken to London by UK police and charged on Wednesday. Ms Garcia-Bertaux, a French national who had been living in the UK for many years, was reported missing after she did not turn up for work at public relations firm Golin. She had been living in the UK for many years, but was originally from Aix-en-Provence. Colleagues had previously described her as "a wonderfully creative, caring and charismatic woman". As well as working as a personal assistant, she was involved in film and had production credits of a number of short films, including Gerry which starred Dame Joan Collins. The actress has said she was "shocked by the horrifying news" of the death. Mr Belorusov will appear at Uxbridge Magistrates' Court on Thursday.